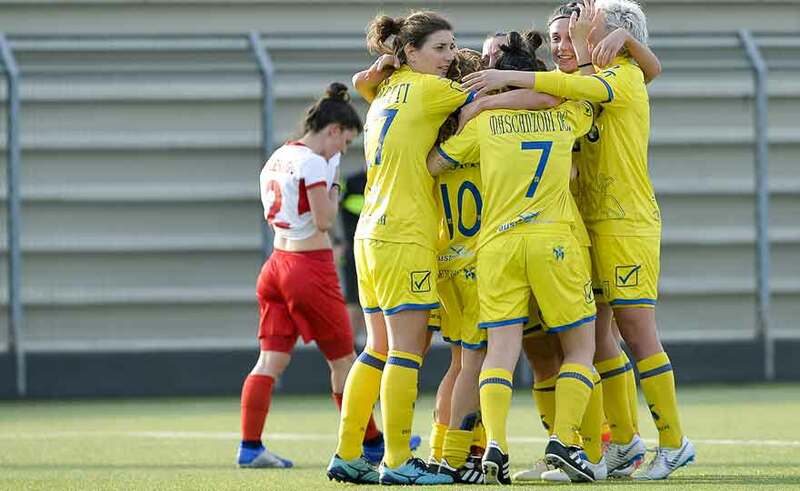 The winning and convincing performance of the one that has been shown today by ChievoVerona Valpo, which in an important clash of salvation has prevailed for 3-1 sull'Orobica Calcio Bergamo. The first jolt of the meeting takes place at the tenth minute: nice idea of ​​Boni between the lines that with a filter serves Tarenzi, the number seventeen clivense takes aim, but Lonni is a good guard. A turn of the clock later, interesting scheme of the Valpo from corner to free Mascanzoni, whose right from the limit, however, goes off at the bottom. Despite an encouraging departure from the landlords at the 10 'it is the Orobica to take the lead. Vavassori with a precise vertical suggestion cuts off the Gialloblù rear and Merli, alone in front of Gritti, has an easy game in fixing the 1-0. Chievo reacts to the 22 'with captain Boni that on a free-kick misses a match with the goal. At half an hour the girls of mister Bonazzoli tie the score: great action of the first Valpo on the axis Ledri - Pirone - Tarenzi, with the best realizing clivense that head can find the 1-1. The draw is a great injection of confidence for the locals, so much so that at 37 'they manage to move the day's table again. The referee decrees a free kick from the edge, on the point of beating is presented by Boni brushing a perfect parable, which is bagged to the right of an innocent Lonni. The scaligere in the recovery fall with determination on the rectangle of play and the 48 'touch the third network of the day always with Tarenzi, which this time can not conclude a sensational action developed on the right by Ledri. At the tenth is Mascanzoni to have the shot of 3-1 in his feet, but his right from a good position ends away from the mirror. In this second fraction Chievo firmly takes the reins of the match and in the quarter of an hour is Tarenzi to become dangerous, unmarked in a handkerchief in the heart of the area and trying to tip to make the personal double. The Verona's efforts are rewarded at the 71 ': Mascanzoni sees Pirone's cut, Valpo's tip is good at carrying the ball forward and putting his seal on the match. Three minutes later, Chievo fails to play poker with captain Boni who can not beat Lonni with a "lob". In these seconds forty-five minutes you play only one door and ten from the end there is a new opportunity for clivense training still with Pirone, stopped this time from the pole. At the final whistle is so much satisfaction for the home team, which leads to thirteen points in the standings, moving away from the scorching area of ​​the ranking.